Army enhanced its ability to carry out secret missions deep in enemy territory at night and in foul weather. The dark, dangerous-looking MH-47E is today’s special operations version of the much – admired Chinook of the Vietnam era. With high-tech terrain-following radar and an infra­red sensor, the MH-47E is the trump card of the US Army’s famous ‘Night Stalkers’. Smaller saddle tanks identity this as an early MH-47D operating with an Oklahoma unit of the Amiy National Guard. The avoidance of enemy missiles relics on low flying and a series of chaff dispensers situated on each side of the fuselage. Situated in the nose is an AAQ• 16 forward-looking infra-red (FUR) turret, which is essential tor low – level night operations. The MH-47E features numerous additions to the standard model CH-47. including radar, an in-tkgN refuelling probe, a complete sot of defensive modifications and additional fuel tanks. 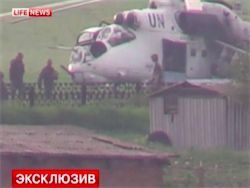 ► Flfty-ono МН-47Е» arc In production; all will be operated by the Special Operations Aviation Regiment. ► Operational equipment includes terrain – following and mapping radar. ► The contract for development of the MH-47E was awardod to Boeing in 1987. >■ Missions Include global clandestine, long* range airlift infiltration/oxfiltration into hostile territory. ► The Chinook can be completely refuelled in less than 4 minutes. Powerplant: two Textron Lycoming T55 i 714 tutboshaft onginor. Below: This MH-47E is seen during maintenance. The type has proved to bo very reliable and looks set to equip special operations units into the next century. Above: The mam transport assets of the SOF are seen here: a Chinook taking oft on an exercise with an accompanying CH-53E. CKt*. aOcwrg rotuertng from a C-130 jwoukr. Wm a length of П rn (36 tt.). it в Ihe "ук: protjn oiinched to any лгсгеїі. Located я :he nose is nn ЛРО-174 terram-tolowng OT wealht» глипт, and mounted linear the chin is an AAQ-16 FUF1 turret the awonca suto meant, that operaiiom can bo earned cut btnow Э0 m |9H it. I.
Ttie ггч» cargo ramp в ottnn «it open dining oporatonn to aftew racxl «ax of troops Occascnauy, a irvitwardfting mochine-gun is Mtfid. mcreawig the atmument further.